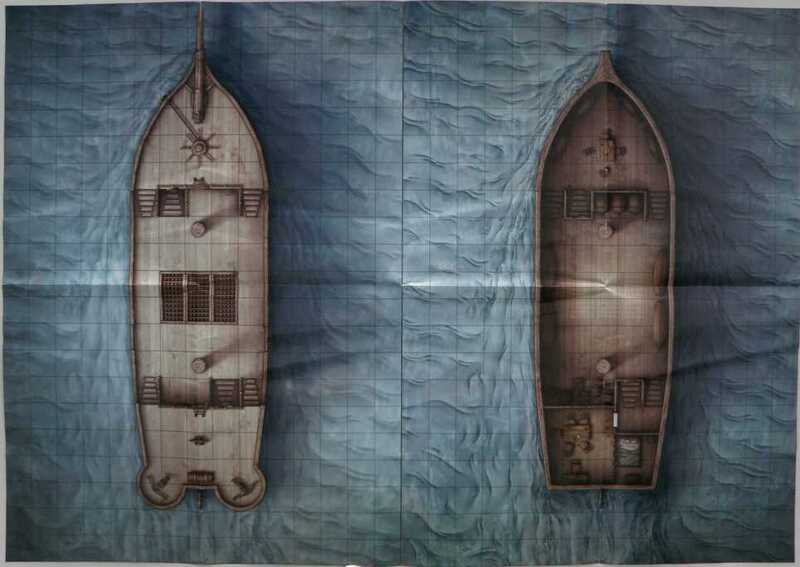 Soon, I will post a catalog of the poster maps printed for Dungeons & Dragons products over the years. 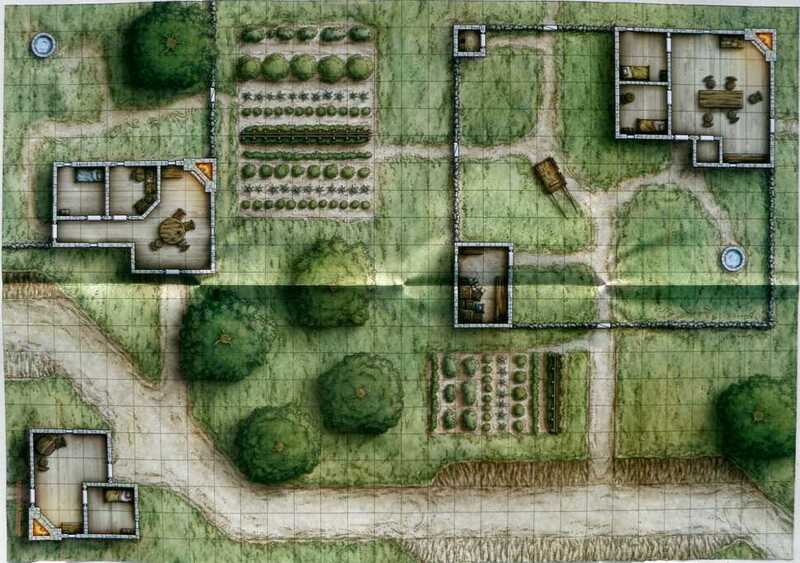 As I compiled the catalog, some maps stood out, either because of the design, or because the maps proved useful beyond the adventure that they accompany. 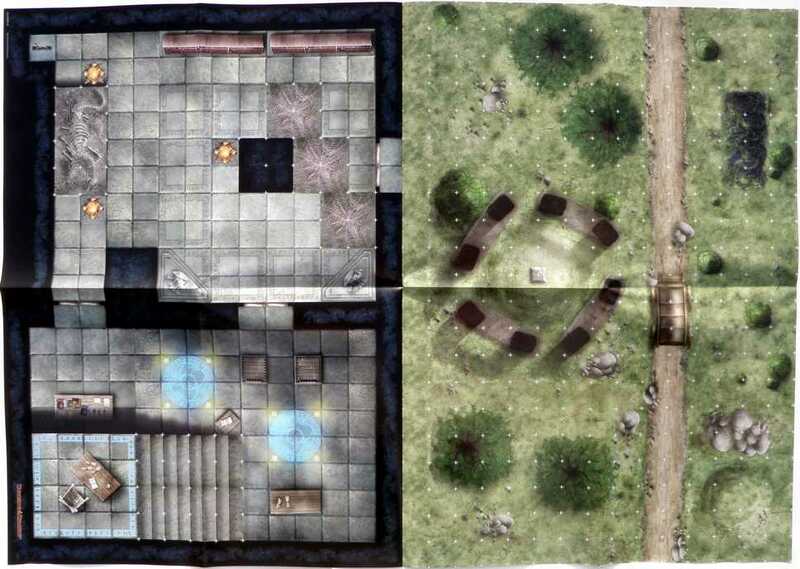 The Gates of Firestorm Peak adventure supported Player’s Option: Combat & Tactics with color battle maps. Artist David Martin painted these maps in a hallucinogenic palette rather than the more earthy colors of current maps. 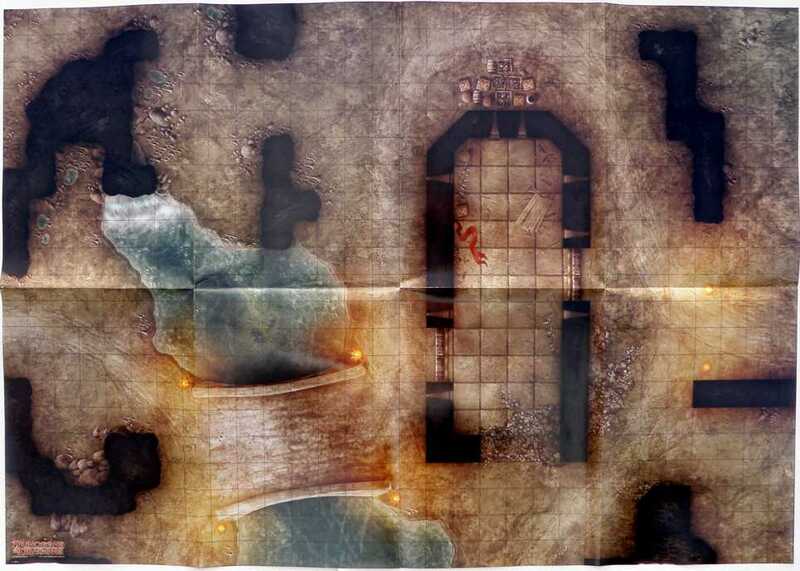 See “Battle maps take over Dungeons & Dragons” for more on Firestorm Peak. 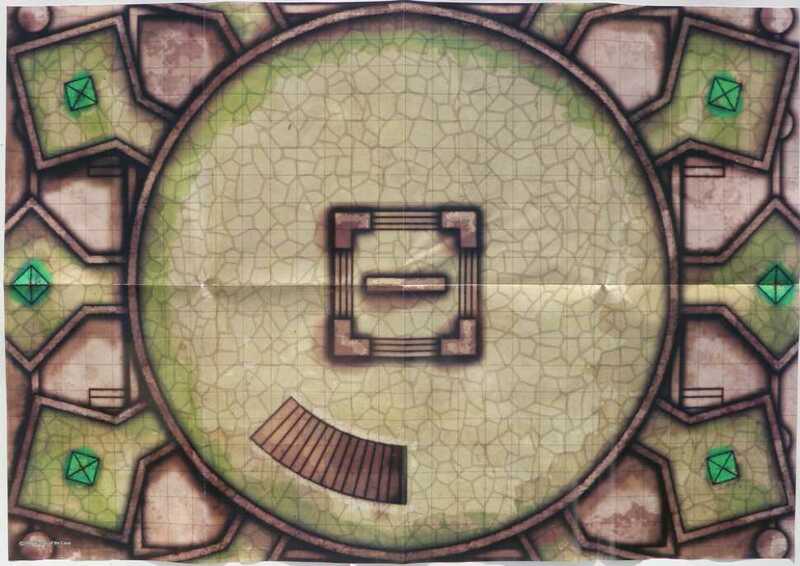 Does the next map look familiar? 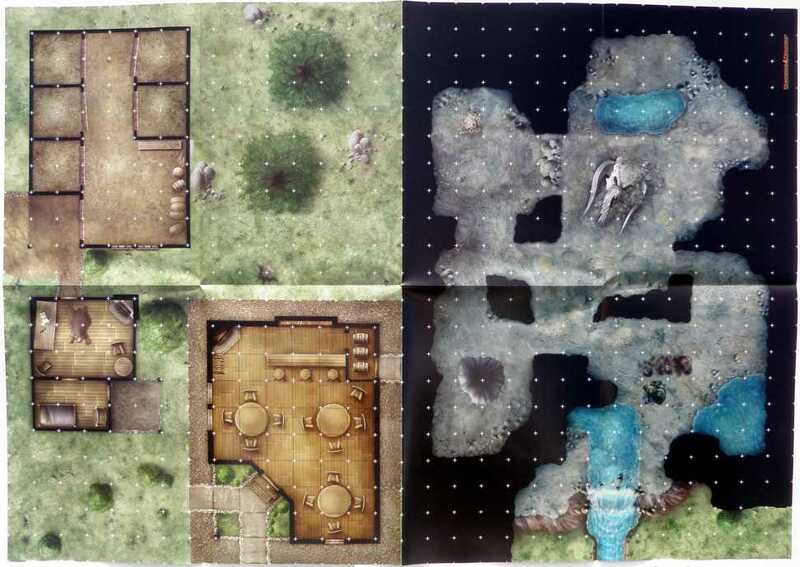 The moathouse from The Temple of Elemental Evil returns as a map in the Village of Hommlet promotional adventure (of course), and also in the Against the Cult of Chaos Encounters season and the Shattered Keeps map pack. 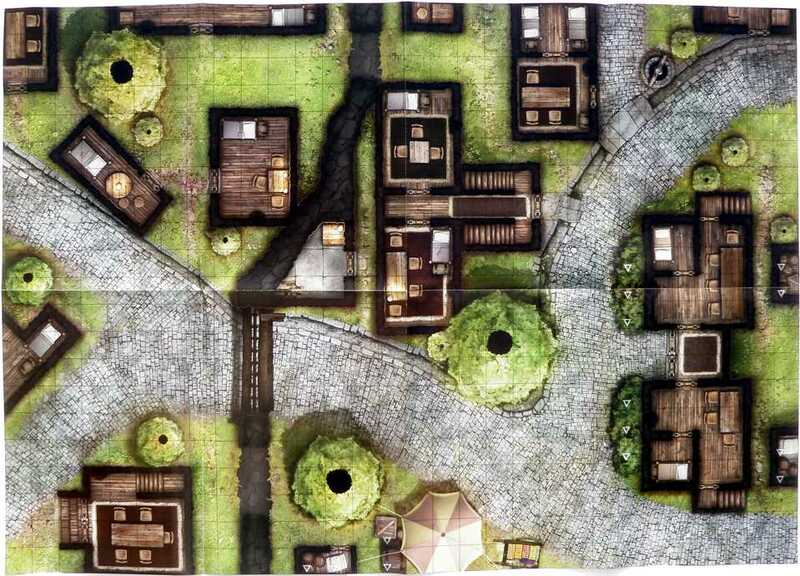 Three map sets included double maps that fit together into a single large location. 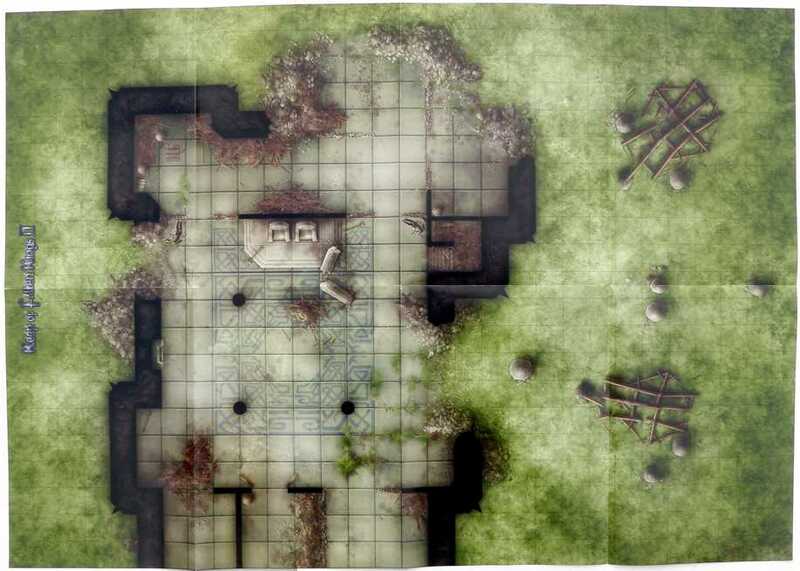 Both Fantastic Locations: Fields of Ruin and Shattered Keeps feature a sprawling ruined castle. 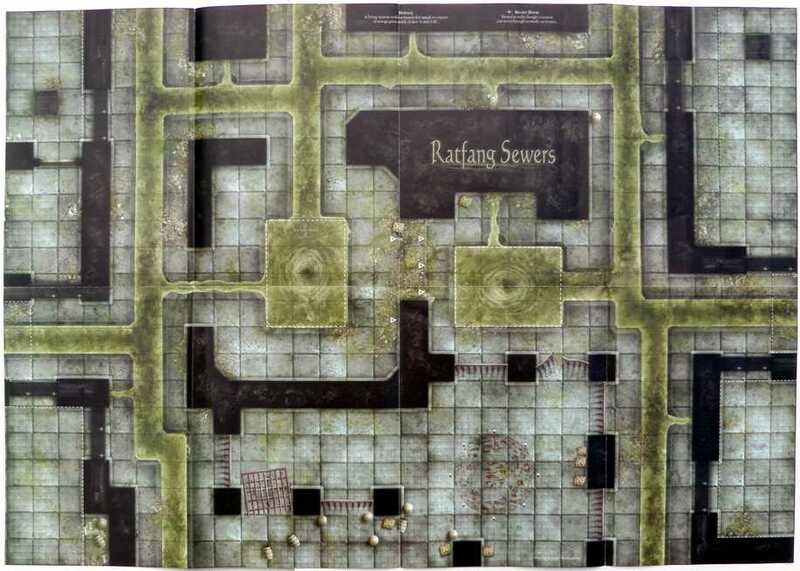 The Vaults of the Underdark map pack includes a river and bridge that may be underground, but could also be out in the badlands. 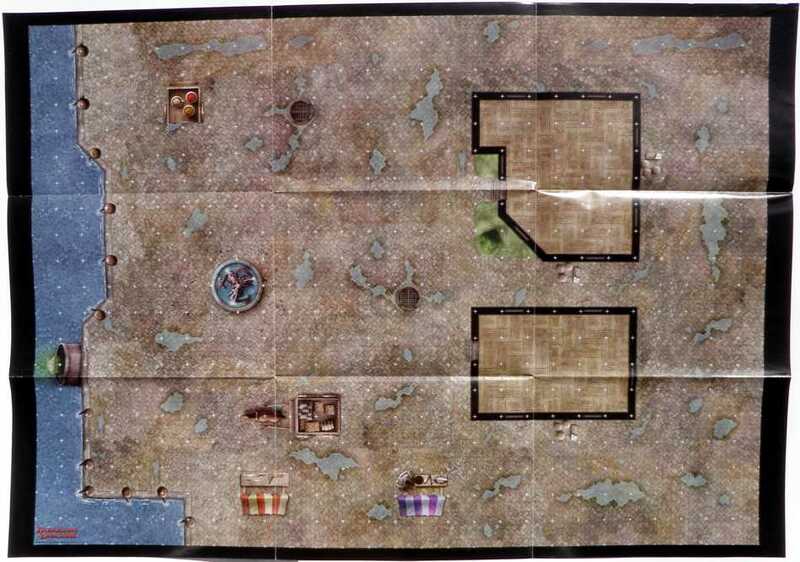 Before Wizards of the Coast started packaging battle maps in every adventure, they published maps intended for D&D miniatures battles. 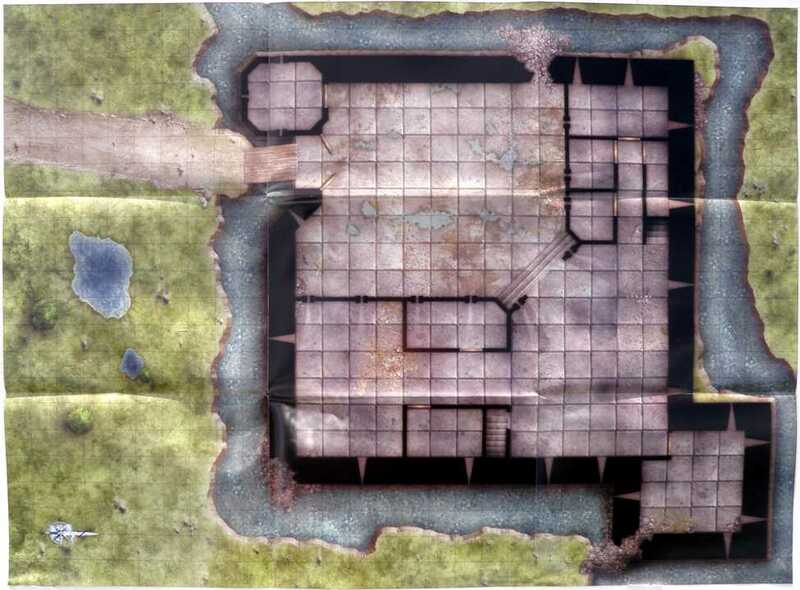 The underground maps include broken walls, which make them unsuitable for dungeon crawls but good for big battles. 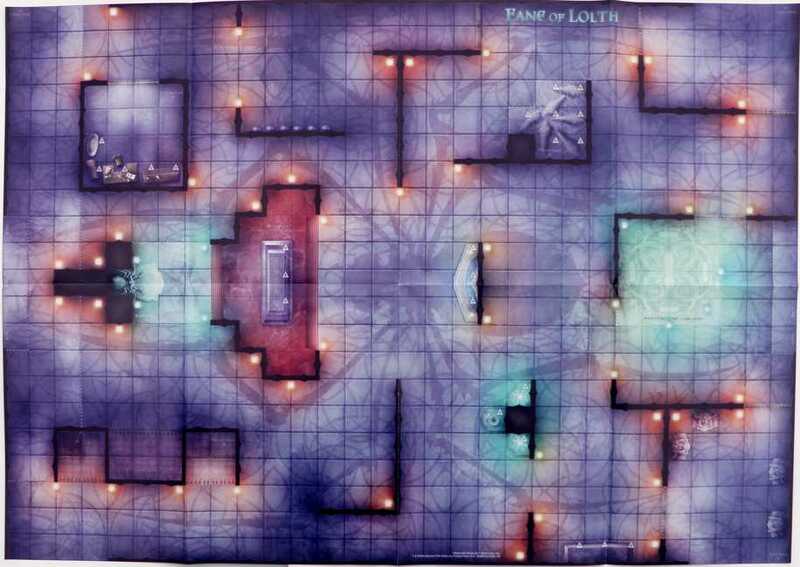 Of the miniatures maps, I favor the neon colors of Fantastic Locations: Fane of the Drow. If you spot a copy of the third-edition adventure City of Peril for sale, snap it up. 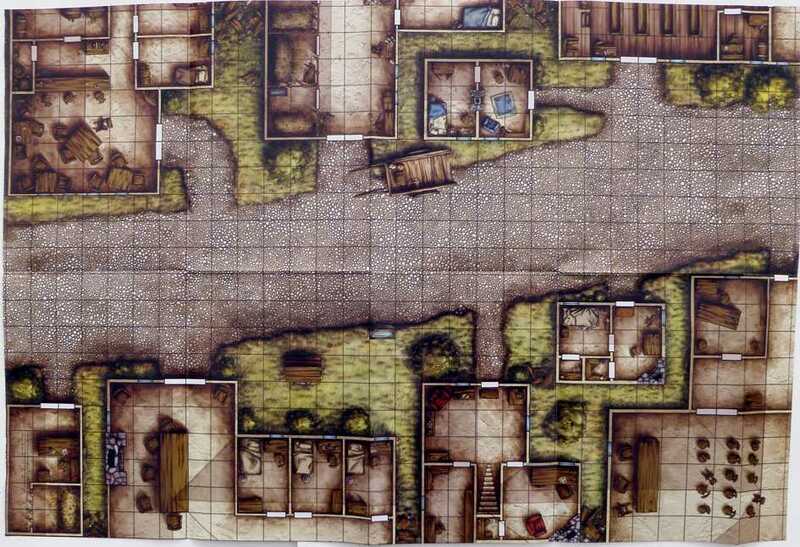 This adventure comes stocked with maps of a town square, an inn, rooftops, and sewers. 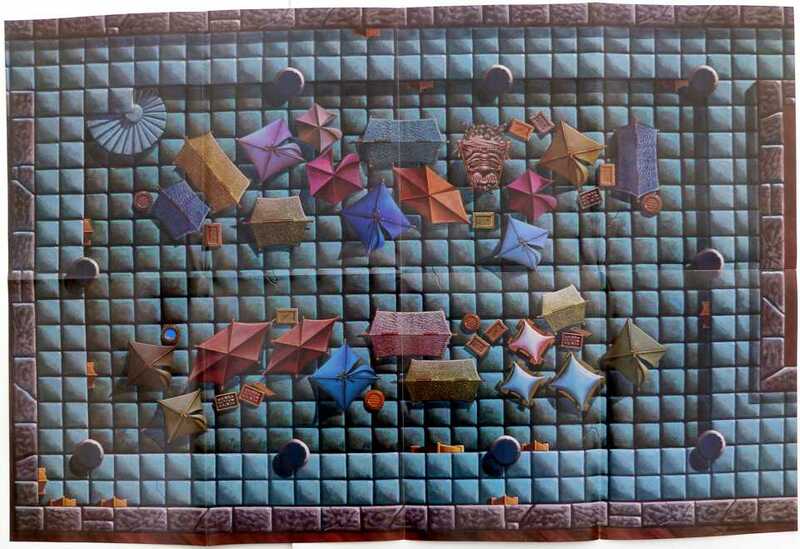 Recently I stumbled on a StackExchange question asking why used copies of the fourth edition Dungeon Master’s Kit cost so much. 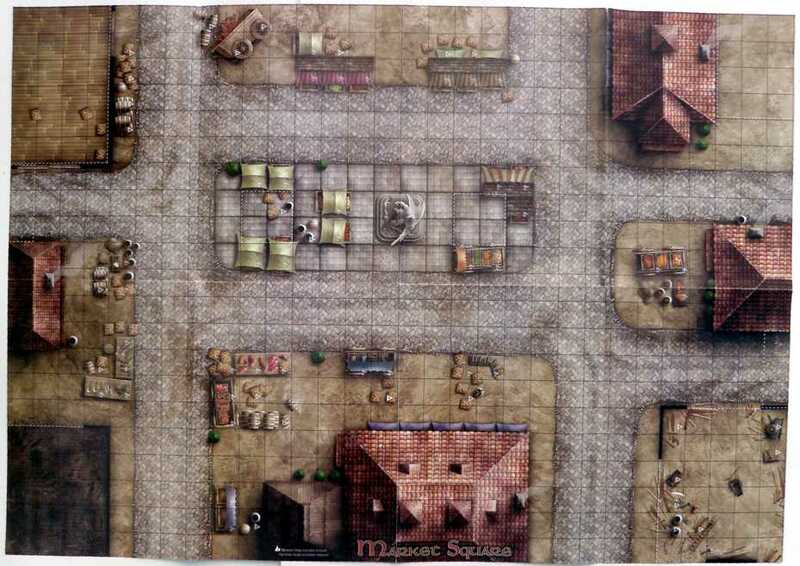 I suppose some buyers covet the monster tokens, but for me the maps are the real draw. 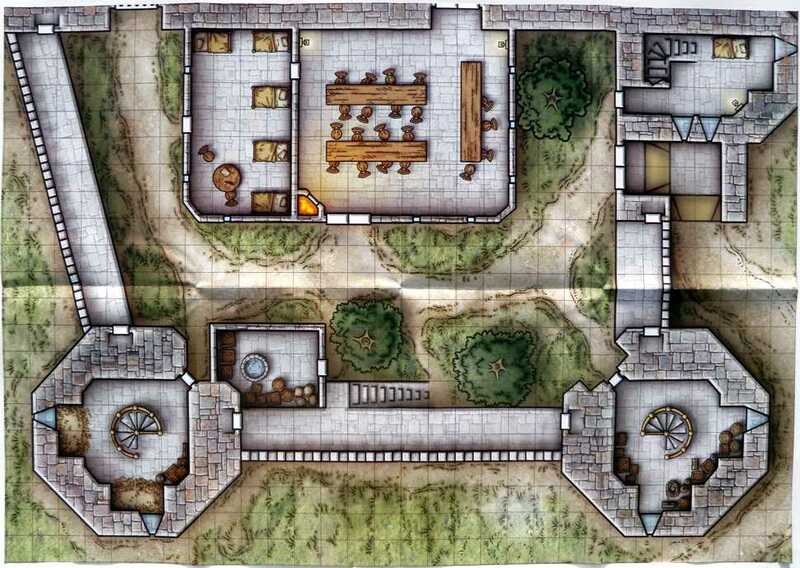 I have used the castle wall in at least 8 sessions. 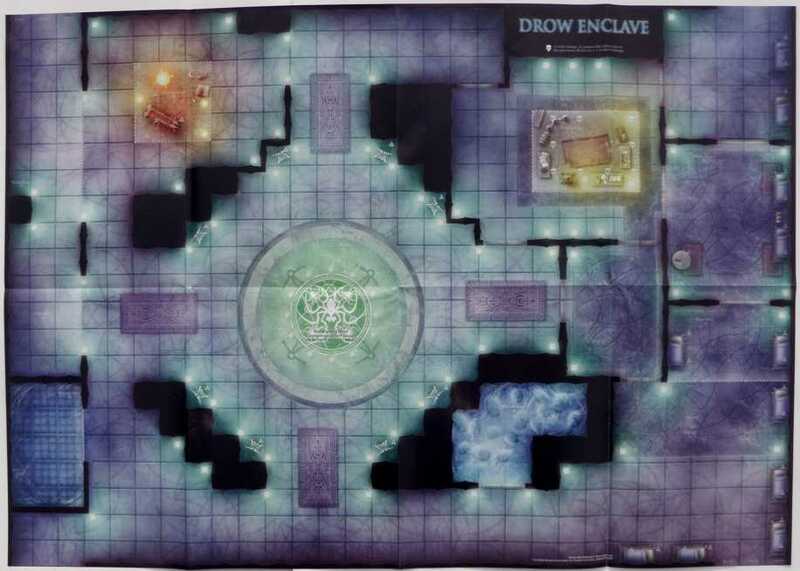 I love the waterfall and magic circles included “Forest Cliff Lair” map included in Fantastic Locations: Dragondown Grotto and Keep on the Shadowfell. 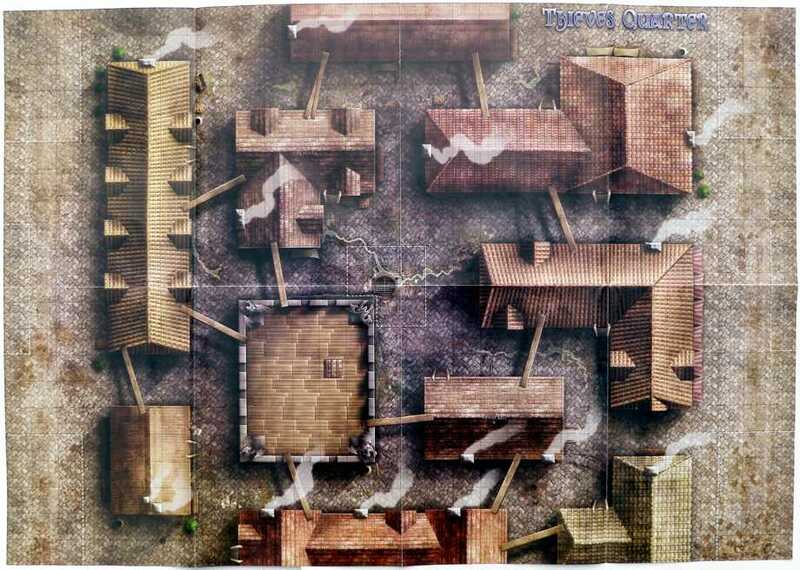 This map fires my imagination more than any other. 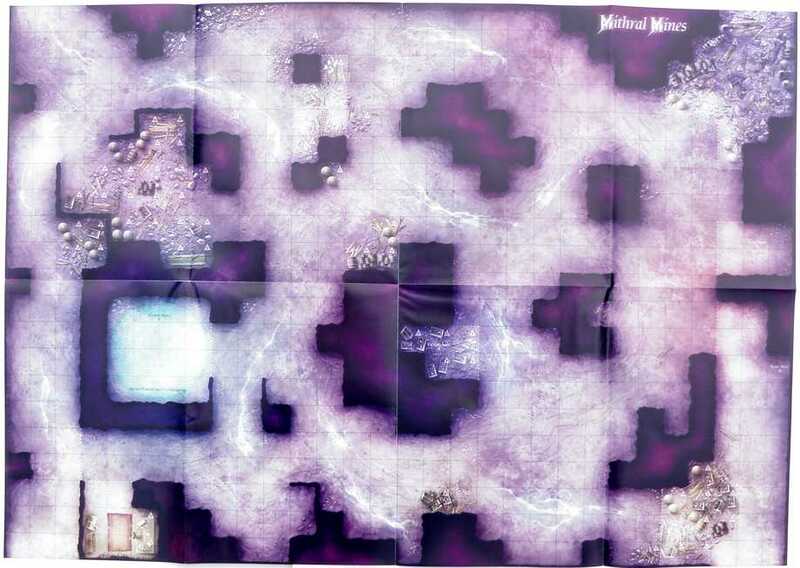 Unlike later adventures with a single poster map, Keep on the Shadowfell included three. 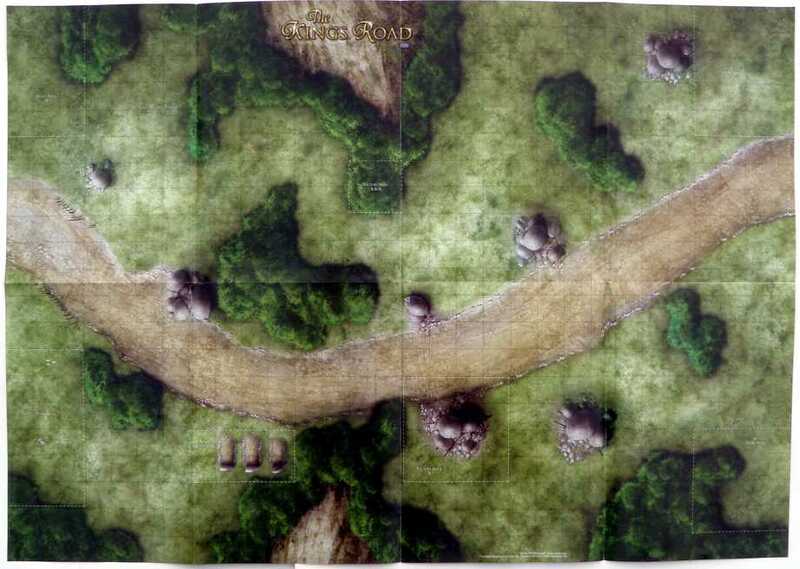 In addition to the “Forest Cliff Lair,” the package includes the useful “King’s Road” map, originally from Fantastic Locations: Fields of Ruin. 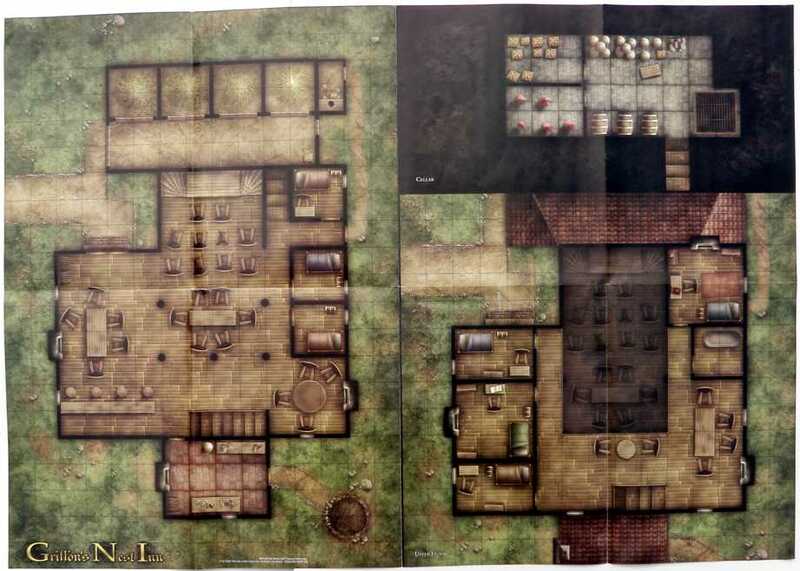 Most of the Lair Assault adventures include specialized maps, but Kill the Wizard includes a three-story house and Talon of Umberlee features a ship. 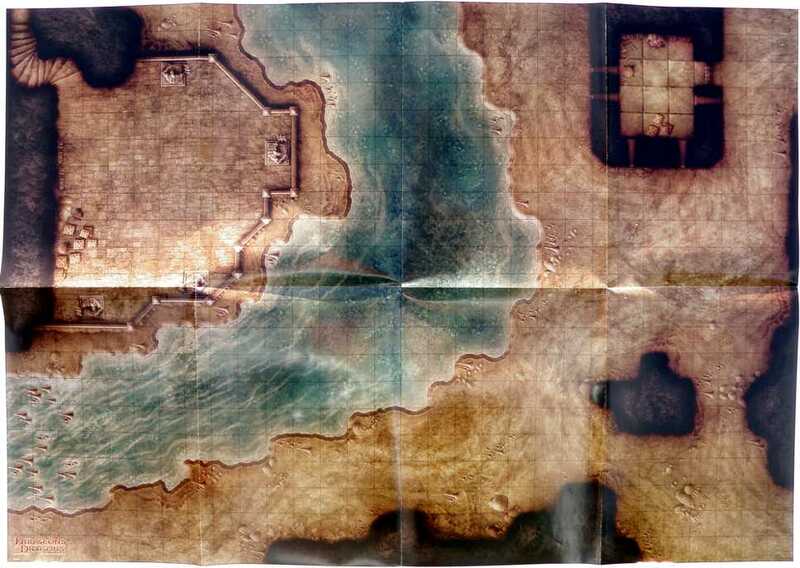 I have reused the waterfront map from Lost Crown of Neverwinter in more than one session. 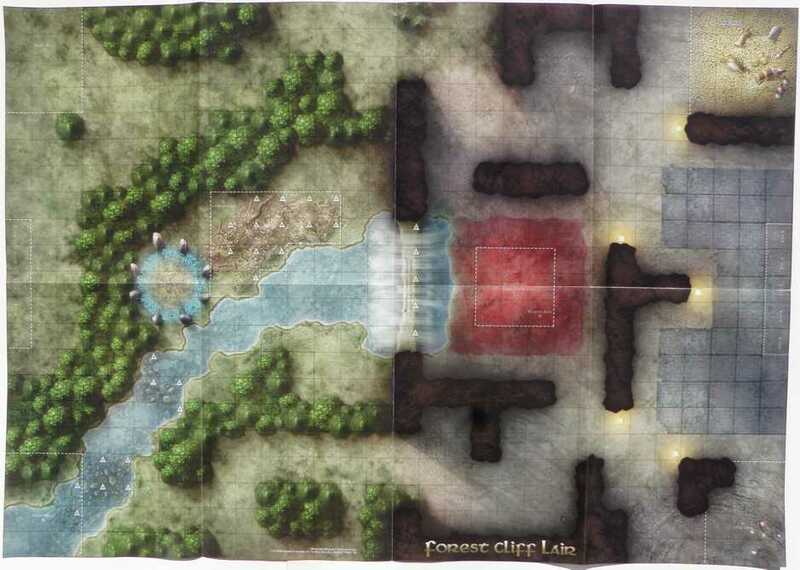 The village map in King of Trollhaunt Warrens and War of Everlasting Darkness strikes me as particularly eye catching. 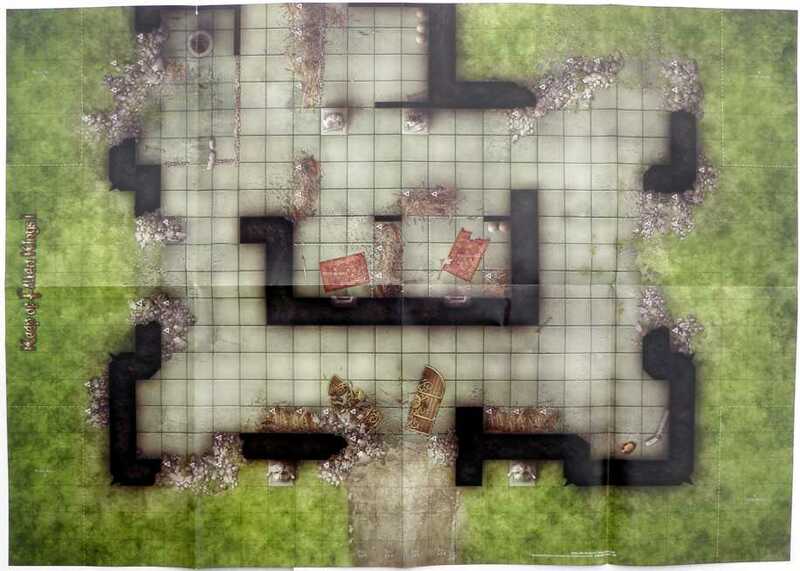 I wish it connected with the similar map in the third-edition adventure Red Hand of Doom. 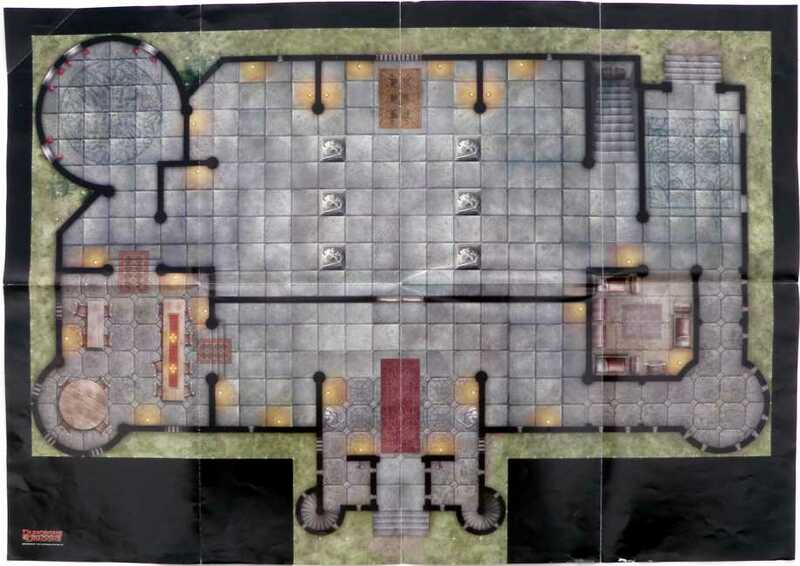 A map in Storm over Neverwinter turned the graphic assets from the Castle Grimstead dungeon tiles set into a grand palace. 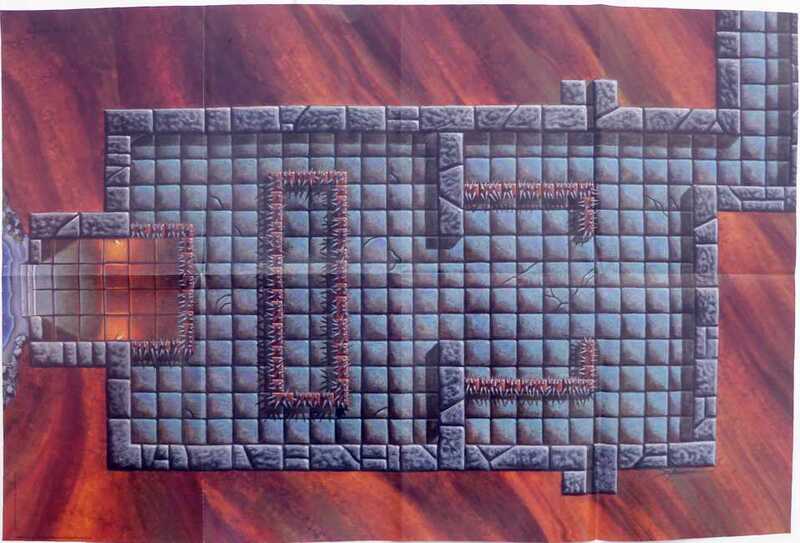 Of all the seasons of D&D Encounters, the Web of the Spider Queen featured the most memorable encounter site: a hollowed out stalactite with bridges connecting three levels. 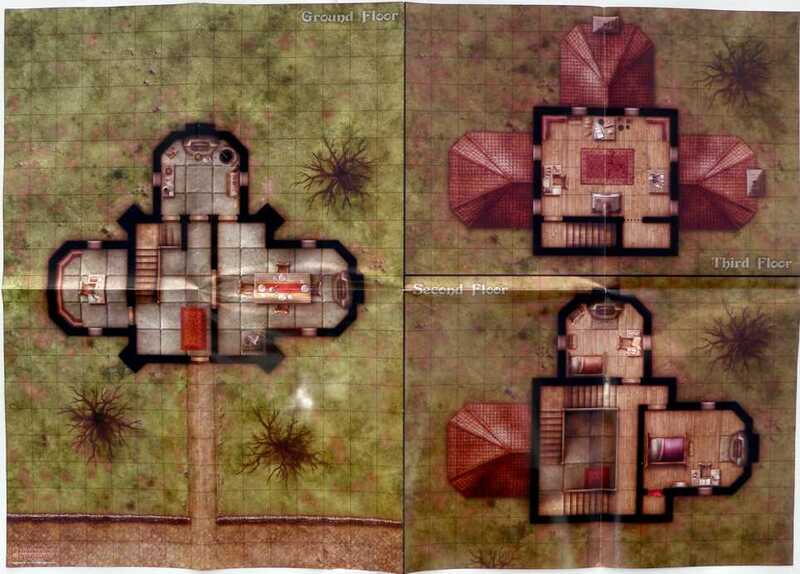 Finally, I have two mystery maps that must have been included with Dungeon or Dragon magazines around 2006. 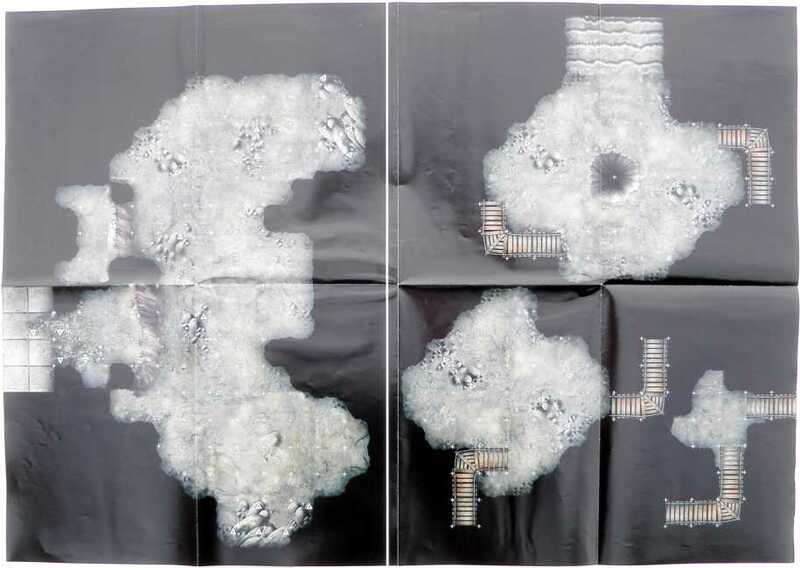 I can’t figure out what magazine issues included these maps. If you can help, please comment. Great stuff. I own almost all of these maps, but did not know about the P1 or Red Hand maps. I must now seek them out! 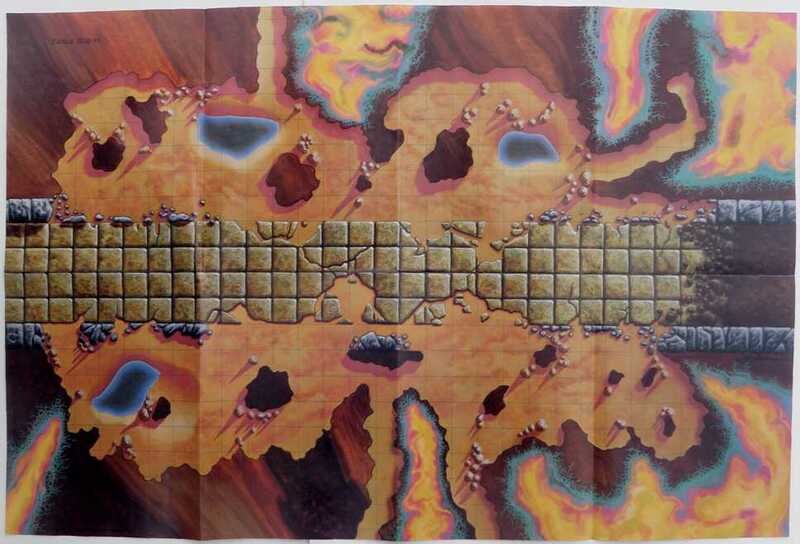 The second of your mystery maps (the “Dungeon Magazine Map”) might be from the adventure “Pandemonium in the Veins” from Dungeon #96. 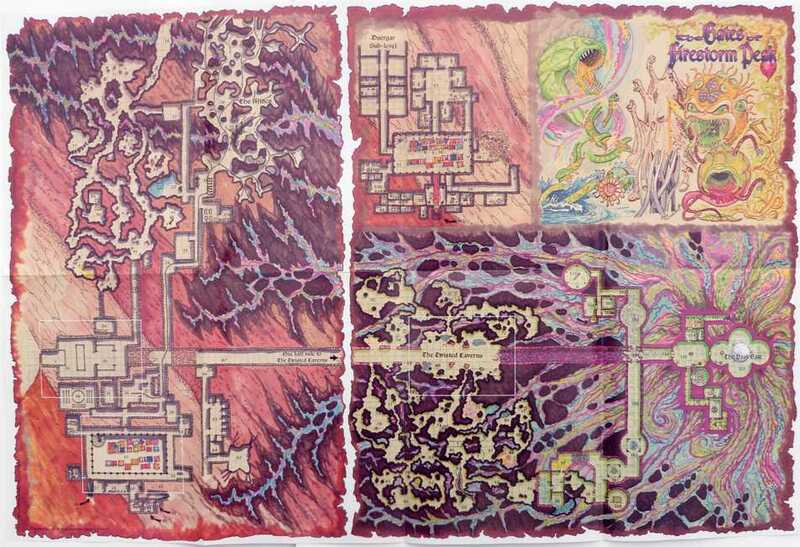 I know that adventure featured a map of the gladiatorial arena and I *think* the opposite side had the alchemist’s lair, which is what (I think) your mystery map depicts. 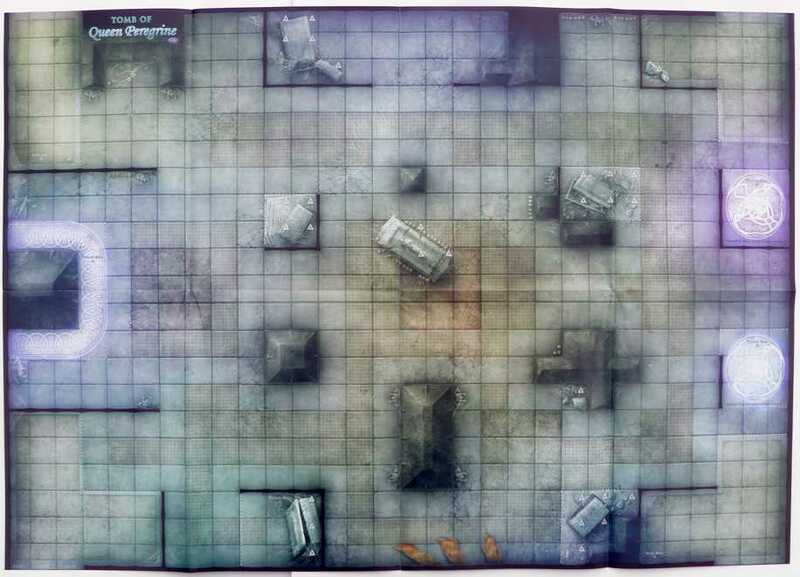 The second mystery map is from Dungeon #96 or Dragon #303. They were a matched set featuring Gladiators. 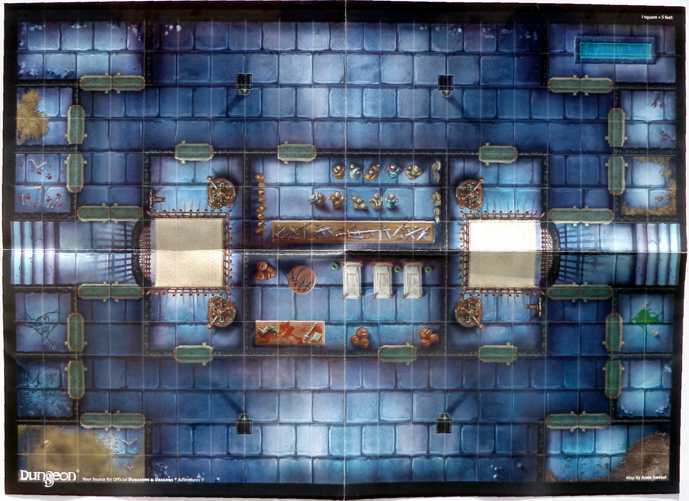 One had the actual arena floor topside, and the other was the map you have shown with the cages for beasts and gladiator prep areas below. I have both on my mancave wall.